I know it’s tacky to leave your Christmas lights up all year-round (thank you to Gretchen Wilson for memorializing that for anyone who was so unenlightened – or should I say so terribly lightened all year). 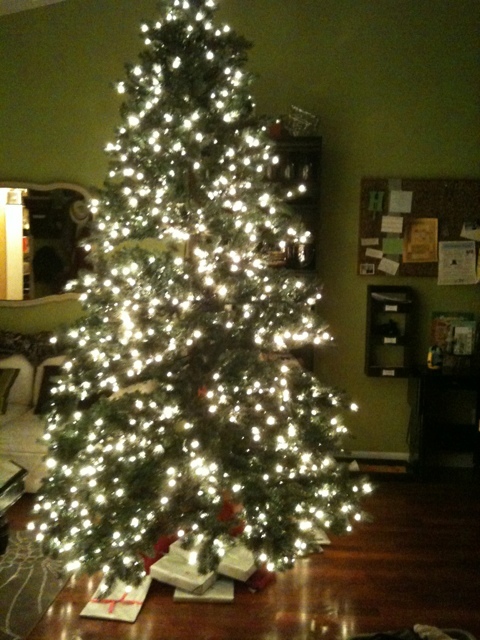 But – what about just the lights on my tree? I love my Christmas tree so much. I seriously want to keep it in our living room all year. Or at least all winter, while it’s so dark and so cold. I think it’s mostly the ambient light and sense of wonder it holds. Maybe it’s that it’s 9ft tall and barely fits in the vaulted ceiling part of our great room – it seems to fill the whole room. I’m not sure there’s anything that I love to see more when first get up, get home, or retire for the evening. Anyone else feel the same? Want to help me try to start a trend? Then it could be awhile winter, but forever Christmas.